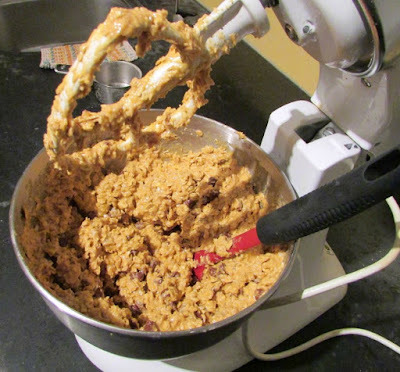 Cooking With Carlee: Chewy Chocolate Chip Peanut Butter Oatmeal Cookies - No Flour Needed! 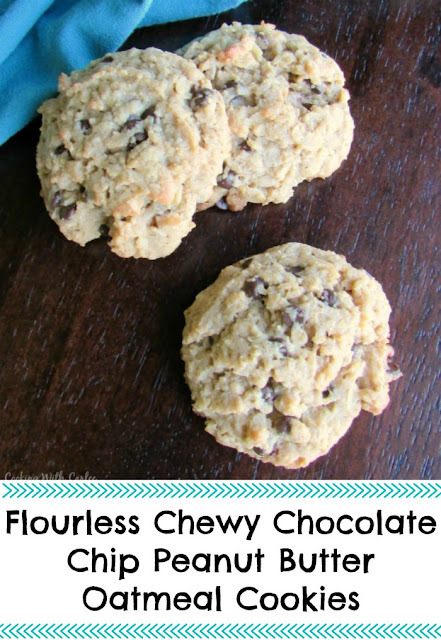 Chewy Chocolate Chip Peanut Butter Oatmeal Cookies - No Flour Needed! 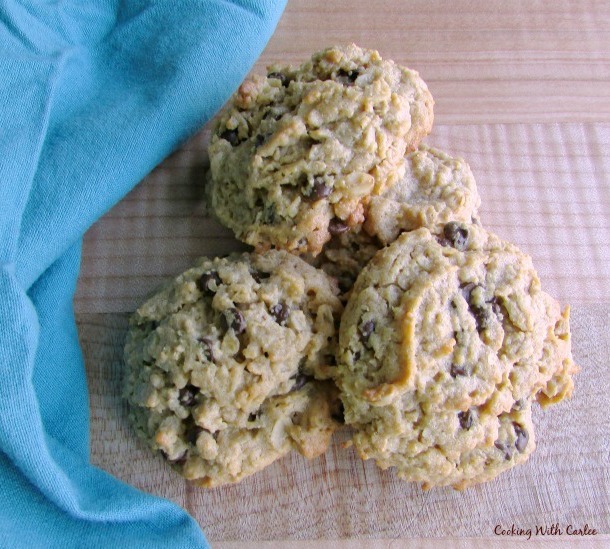 These no flour cookies are full of peanut butter, oatmeal and chocolate chips. It makes a big batch, but you can freeze some dough for cookies on demand later! These are my go-to drop cookies. They are always go over really well. It is a big batch, so be prepared to share. 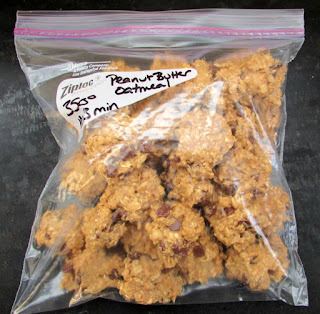 They are chewy, peanut buttery and full of oatmeal goodness. I love baking them in big soft cookies, but they are also good as smaller two bite cookies. One of Little Dudes's daycare ladies is having a birthday, and I wanted to make something peanut butter for her. She loves peanut butter pie, but that is hard to share with the littles. Cookies are so much easier to give to a dozen hungry tikes! I knew this would be the perfect thing. I made enough for them and some for the kids. The rest of the batch went in the freezer for later. Now we'll just see how long that lasts! All you have to do is mix everything together and drop them on a cookie sheet. Then bake them until they just barely start to brown around the edges. Freeze whatever dough is left for more cookies later! Fresh cookies ready at a moment's notice! These no flour cookies are full of peanut butter, oatmeal and chocolate chip goodness. Freezer instructions included too in case you don't want to make them all at once! In a mixer, cream together butter and sugars until light and fluffy. Stir in eggs, one at a time and then stir in the peanut butter and vanilla. While the mixer is running, slowly add the baking powder and mix thoroughly. Add the oatmeal and stir until combined. Fold in the chocolate chips. Drop 1 1/2-2 Tablespoons of dough at a time onto a nonstick or parchment lined baking sheet. Bake 8-11 minutes or until the edges are slightly browned but the middles still look soft. Cool on baking sheet for a couple of minutes and then move to a wire rack to cool completely. If you don't need the full batch of cookies right away, drop balls of dough onto additional cookie sheets and placed in the freezer overnight. The next morning, put them in a zip top plastic bag. When you are ready for a fresh cookies, take out how many you want and bake them for a minute or two longer than you would otherwise. You can have fresh baked cookies any time! They look scrumptious!! Thank you for sharing! I see that you used both racks in your oven. I am never brave enough to try that - I guess I figure the ones below won't get done as well. What advice do you have for using both racks? Thanks! I turned on the convection oven for these, so the air circulated around both trays pretty well. However, sometimes I cook two trays at once and just switch them out half way through the baking time. That way both trays get done pretty uniformly. Yummy! I love peanut butter and I love oatmeal, but for some reason I don't think I've had them together in a cookie before. I can't wait to try these! I really love these. They are my favorite non-frosted cookie! Double yum! Thanks for linking up to Funtastic Friday. Hope to see you again this week. I could go for a couple right now! They have oatmeal in them, so it would be an acceptable breakfast right? See you Sunday! Thank you for hosting! See you Monday. Hi Carlee- I'm new to your blog and found you via Oh My Heartsie Girl Wordless Wednesday. 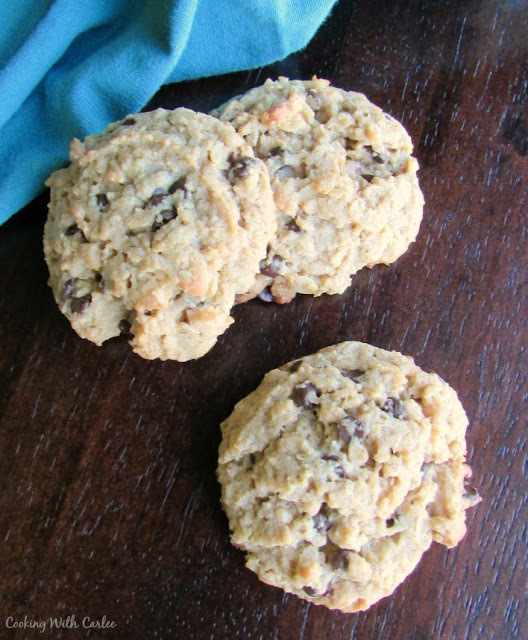 I always check new recipes and I love making cookies so I'm sure these will be on the short list to make soon. I'll add a link to my blog to where I found the recipe. These sure look good. Just need a glass of milk! Oh, yum! I have never tried cookies without flour. I think I will just have to give these a try! Just using the oatmeal makes them so chewy and delicious! Thanks, Amy! These cookies and monster cookies are two of our family's favorites and both are filled with peanut butter and oatmeal. YUM!! I've never tried cakes or cookies with the convection. I will try these and see how they work out. The wind is to blow this weekend so no outdoor gardening for me. Baking is my other option - oh well I could clean house. Maybe. We are supposed to get a fair amount of rain this weekend, so I have Easter baking for the blog on the agenda! If you turn on the convection, you just have to keep a close eye because it seems like they brown more quickly. But, I like that you can get crispy edges and soft centers if you get it timed right. Peanut butter and oatmeal are two of my staples! Thank you! Love the frozen cookie dough idea! Can never go wrong having that secret stash! If only I could keep that stash a secret from myself! Thank you, Wendy! I suppose there is enough oatmeal in them to make them stand tall and proud. Now if only I had the will power to make the freezer stash last longer!